As a fashion designer or boutique, your e-commerce page is one of your biggest assets. It is the one and only page that plays a critical role in generating revenue for you. So, it’s crucial that it should provide a path to least resistance for your customers to finish their purchase. We will discuss what are the top 5 must have’s on an e-commerce page, to increase your conversion rate. Top navigation is often overlooked but it can be utilized in offering key information that every visitor could need. If you are offering discounts, you can showcase this above the top navigation, so it’s visible to every customer who visits your site. eg: when you visit Modcloth, they tell you about the latest coupon or discount offering on every page you visit. If you are offering any rewards for customers, use that area to showcase it. eg: Zappos uses it very effectively and the customer can see what they would get by signing up for the rewards. It works well for them because firstly, it incentivizes the customer to purchase an existing product and it encourages them to come back in order to keep gaining rewards. If you are offering free or discounted shipping, showcasing it on every page above the menu can lead to more conversions. eg: Sephora offers 2 Day Free Shipping for each order. Data shows that 10-12% of people visiting e-commerce site use search menu. It’s critical to have especially if you have the number of items on your e-commerce website. Always have a shopping cart on the top right corner of the page, especially after the user has added at least 1 item in the cart. I have come across pages that do not show it and made me hunt for the cart which was a no-no. Zara does a great job of showing shopping cart on each page. And when the customer clicks on it, it shows all the items in the cart, which can be very helpful. I can not stress enough, how important this is when you are in the fashion industry. An awesome captivating image can make or break a sale. Make sure the images are high resolution and perfectly fit the image size you are using for your page. I have seen pages, where the images are granular as they get “stretched” to fit the image size. Consumer’s level of trust is declining towards images because they can be easily manipulated with photoshop. Having a 10 sec video that show’s how the dress looks on a model can make the customer more comfortable with the purchase. Zappos has short videos for almost all of their shoes and it has increased the conversion rate, significantly. 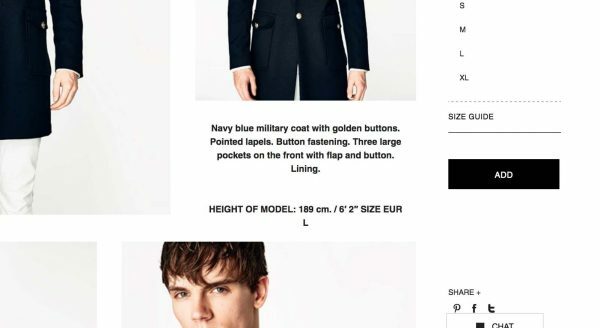 One thing that I really love about Zara’s product page is that they tell you the height of the model wearing the jacket or pants. This information works very well for me because the last thing I want is to order a jacket and then find out it’s too short or long for my height. If you can, include the size of the model so your customers can imagine how it will fit their body structure. Please please please do not include images that are too big. If a customer has to scroll up and down the page to view the full image, you have lost them. Pick an image size that fits perfectly on your page. Choose product name that your customers are using when purchasing competitor’s product. Don’t try to come up with creative product names and customers can’t relate to. This would also help you in SEO because Google will be able to put user’s search query and your product name/description together and show you in the search results. If your naming convention is very unique, you could lose Google organic traffic. You can take more leverage with naming convention after you brand has been established and you have customers visiting your website directly. Try to keep the product description to 2-3 lines, do not get carried away. Your customers have limited time and they definitely do not want to read thru a paragraph of description. Keep it short, and if you have to have more than 3 lines in the description; turn the paragraph into bullet points, so it’s easier to read. Your product features should tell user all the information you think they would need to make a purchase decision & be happy with their purchase. • Return shipping cost etc. Most fashion designers or boutiques often slip at this step but this could be the most critical step of all. Till now, you have answered customers questions about special offers, product details but now it’s time to close the deal. Use this area to answer the queries a customer might have when they are ready to start the purchase process. Get your developer to add a plugin to determine customer’s location. And based on their location or shipping destination you can give them information on sales tax. If you are offering free shipping or fixed pricing shipping, having that information on this page can be a very good incentive. Find out where your customer is located and show them pricing information in their local currency. You do not want to show pricing in dollars to your European customers. Provide a link to your return policy or if you are offering free returns, mention that on the product page. This is important from case to case basis but if your product and customers require a warranty, then you should provide a link to that. People want to buy what others have. This can be a great way to boost product sales by offering social proof about how many customers have bought the product or shared the product page with their friends. Do not show links or images to other products similar to the main product on the product page. If you are selling dresses, and the customer is on the product page for your dress, do not show them images or links to other dresses. Because it could distract them and they would click on other dresses and then other and next thing you know, the customer is in “exploring” mode rather than “purchasing” mode. If you offer too many options, it can often distract the customer. Your main goal is to get the customer to start the purchase process when they are on the product page. And you do not want to distract them. One and only exception is that you can show “complementary” products on the page. for example: if the customer is purchasing a dress, you can show them add-ons as shoes or purses etc. But I would still be very careful with it. What you can do is test out 2 different versions of the page where you offer complementary products and page where you do not. And see which one converts better & proceed accordingly. These tips are good to add to your checklist as you get started. But you should always be testing different versions and offerings to see which one converts better. There are multiple e-commerce platforms that have built-in capabilities to test these out. 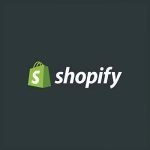 One of my favorites is Shopify. • Why they bought from you and not your competitor? • Which information was critical to them while making the purchase? • If there was one thing they wish your product page had, what would that be? • At which step did they decide to abandon your product? • What part of the page was too confusing? • Which part of the page or information that distracted them? Use the above tips as guidelines to build your e-commerce page. You should always A/B test different versions and options to see which one’s convert better for your client base and reform your e-commerce page accordingly. this is great, I have been offering free shipping but never thought about adding it to my home page & every page, I only had it on check out page. Going to try this out and I feel it would work well. Simple ideas but most often we overlook. thank you Simone, I am glad its helpful.